I love playing in tournaments. Don't get me wrong, casual golf is great and there is nothing like hanging out with your crew and getting in a round or two at complete leisure, but it just doesn't pack the same punch. You know what I mean; the anticipation up to the day of the event, the first throw of the day, the first thirty-foot putt for birdie, and the list goes on. I live for the spirit of competition and testing my prowess against that of my fellow golfers and it is what drives me to continue to improve my game (and there is always plenty of room for that!). Everyone wants to play to the top of their game on the day of an event. There is quite a bit that a player can do right and wrong, both leading up to and during an event. After playing an event in Seattle (a two round C-tier) I got to thinking about my performance over the day. I'm not talking about my actual score, but what I did to either help or hinder my scoring chances. In this case I am also not thinking about long-term preparations (practice, health, etc) but just what I did or did not do that day. It was nice to start the day out with a yep. Although I said this was about just this day, this kind of includes the night before. I got to bed at an early enough hour so that I was well rested for the day ahead. This can sometimes be tough when you are traveling and spending the night with friends you don't get to see all of the time, but it is for the best. Hey, I'm being serious here. You paid some money to play in this event at least try to arrive awake and able to kind of stand upright.maybe. Right on, two in a row. I like to eat a consistent breakfast before every tournament I play in. If I have the same breakfast that my body is used to then I should not experience any unforeseen body needs during the round. There is nothing like eating something that does not agree with your metabolism and you spend more time looking for the next restroom than concentrating on putts. For me it's the Number Three with a Large Coke from the Golden Arches. Also, I suggest keeping it as small as possible without making yourself hungry before the round is over. The less energy your body is using to consume food the more energy you have to play. I knew it was too good to be true. I couldn't even start the round before I made a mistake. I had volunteered to help out with the event, which meant I needed to bring my tourney gear and get it all set up. I did bring everything, except I probably should have shown up way in advance to set it up and still give myself time to warm up. As it was, the set up was just finishing and I had the leader board posted just in time to hand out the cards to the groups as they headed out to their holes. I was able to get to my tee in enough time to stop breathing hard before the two-minute warning. Playing a tournament without any warm up is officially not recommended. The only pay off is in testing your ability to keep your cool as you throw real shots that look like warm up shots. Why do they look like warm up shots? Because that is what they are when you have thrown no other shots. Thank goodness I started on a stretch of holes where you should only hope to birdie 5 of 6. How well did I score on these holes? One birdie, five pars and one lesson learned. Remember, although people really focus on the final holes, you may lose a higher finished based on not being prepared for the earliest holes. I do get to follow it up with a yep though. While watching my group go up on me by anywhere from three to five strokes, I did not panic. That's right, in the immortal words of Douglas Adams, DON'T PANIC. I knew we still had 36 holes to go (no, I didn't add incorrectly, it was a 21 hole course) and I had more than enough opportunity to get back in the game. Remember, there is nothing you can do about holes gone by. You can however still do something with what lies ahead so keep your focus and play your game. 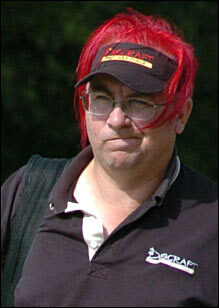 Caught in a 'NOPE' moment is Team Discraft's Scott Papa. He lives and plays disc golf in Washington state. It was right about the time when I was remembering how to control a throw again when I suddenly decided to lose focus on my mental game. I had just missed a putt because I thought it was much more interesting to see who was walking down a path rather than concentrate on the basket I was putting into. I then stepped up on the next tee and decided to throw at a couple of joggers instead of that goofy looking thing with the chains hanging on it. This is what I affectionately call "Being Stupid." To correct: take your time and free yourself from distractions. Get focused on your throw and stay right there. I was slowly but surely coming back and catching up to my brothers, when I had a tricky hilltop putt of about 50 feet for birdie. Make it and I gain a stroke plus put extra pressure on my card mates who I am catching, miss it and expect a downhill rollaway for a guaranteed OB four or possible five. I proudly line that baby up and throw it dead in the heart of the dirt spot just short of the basket for an easy three. The moral: don't try to make shots that are out of your typical agenda. Sure, I make a good percentage of 50 foot putts, but I miss a greater percentage and the miss was going to be deadly. More holes are on the way so don't give up any strokes when you don't have to. We are well into the second round when this "nope" happened. The good news is that it wasn't my "nope" and that ends up being a "yep" for me. You may be thinking "That's not cool; you shouldn't be thinking another person's mistake is a good thing for you." Well, this is why it is a competition. I guarantee that no player felt bad that I missed the putts I did in the beginning of the round and I would not expect them to. I make my mistakes and others benefit from them. Now I had come back, and those who had been leading were feeling the pressure. The key here is to not let others know that you're feeling that pressure. With every unhappy utterance from my card mates about their own throws, I felt them losing control and sweating the race. This is turn gave me a big boost of confidence. The confident thrower is a sure thrower and is throwing to win. The person lacking confidence is now throwing in an effort not to lose. Give me confidence and get out of the way. The final "yep" for this event was playing solid, consistent golf. Though I started with no warm up and horrible putting (which is normally my saving grace) I played solid golf for two entire rounds. How solid? Two bogey free rounds and a 1000+ rated second round to come back for the two-stroke win in the Open field. Oh yeah, that would definitely have to be a "yep". If you can keep your "yep" count up and your "nope" count down, you should be on your way to having a successful tournament experience. 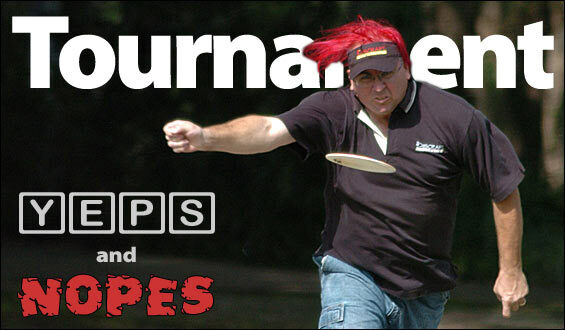 Get more disc golf tips from Papa Tart on his Team Discraft page.